Although a great looking set, it was discontinued, see some of my other conversation sets here. If you have a place by the water to set up an outdoor patio conversation set, try this set that has the finish similar to driftwood that will work and look great. The Better Homes and Gardens Cane Bay set has that beachy look. The faded wood color reminds me of drift wood and at a fraction of the cost. New this year and only available from Walmart.com, you can pick up at any local store or have it shipped directly to your home. Walmart does offer some assembly on your patio furniture, ask your local store about these options. If you need more information to see if this set is for you continue reading. You will get three big boxes for your set. The table box is 38 inches long, 27 inches wide, 4.5 inches tall and will weight 28 pounds. The chair box is 57.5 inches long, 36 inches wide, 10.5 inches thick and will weigh 79 pounds. The bench box is 57.5 inches long, 36 inches wide, 9 inches thick and will weigh 57 pounds. These boxes will not fit in most cars, you will need a pickup or large SUV to get this set home. The frames are made of wood with a polyurethane finish that will last many years in the outdoor environment with little or no care. The finish is a whitewashed driftwood look. For any area that you want to look beachy, this is the finish you are looking for. The coffee table has a slat top design with straight legs and one cross bar for lower support. It is not big enough or tall enough for an umbrella. Need to look at offset umbrellas if you want shade with this unit, I have some examples here. The table is 36 inches long, 24 inches wide and 18 inches tall. The two chairs have a similar design as the table. The seat bottom has wooden slats for the cushions to sit on. The back has an arched design and is tilted back for comfort while sitting. The chairs are 33 inches tall, 32.75 inches front to back and 25 inches wide. The seat is 13.5 inches off the ground without the cushions. The bench matches the chairs in design. The back is straight across, it still has the tilted back design of the top portion. The bench is 47 inches wide with the same other dimensions as the chair. Each seating position is designed to hold 250 pounds of weight. The cushions have an Olefin cover and filling mad with a polyurethane foam pad and polyester fiber batting material. This combination is very good in outdoor conditions, I would still recommend a storage solution for longer life outside, I have some storage solutions here. 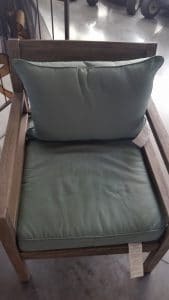 The seat cushions are regular squared cushions about 3 inches thick, the back cushions are pillow type cushions. The pillows in the picture are not included with this set. Assembly of your set will require a Phillips screwdriver and a rubber mallet. When all assembly is done the mallet is used to set the wooden plugs to cover the screws used during assembly for a cleaner look. Now lets get to the steps for assembly. You will need help to rotate the chairs and love seat during assembly. I will begin with the chairs, make sure you look at all markings and arrows when doing assembly, this will assure that you will not have to remove parts to get the part together properly. The side rails will need to slipped onto the seat portion. Lay one arm down and start with the back, center support and seat section, insert each section into the arm and then put other arm on top. Add screws to second arm and then rotate assembly to add screws to other arm. Do final tightening of screws after unit is sitting on its legs for best results. Repeat for other chair and you are ready for cushions. 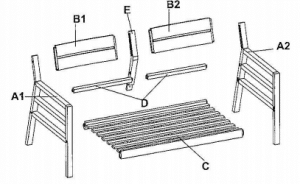 The bench will require similar assembly, just a larger seat portion and a center back support. Add cushions and you are ready to relax. The table will require top to be upside down. Attach one set of legs, center support and then other set of legs. Do final tightening while on a smooth flat surface for best results. Care of your conversation set should just be with a mild soap and water. Do not use any harsh chemicals as they will damage the painted and finished wood. The cushions should just be wiped off with a damp rage. This is a great set for that beach look in your outdoor space. 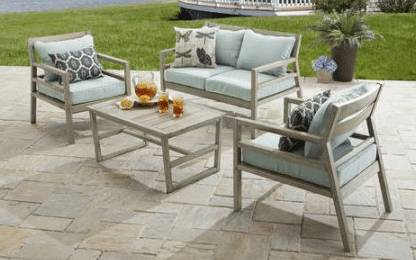 The Better Homes and Gardens Cane Bay outdoor patio conversation set will make any patio look like it is right on the beach. With little or no care this set will last many years without a lot of care. I would recommend this set for any one looking for a wooden conversation set for a reasonable price. If you enjoyed this information, please pass on through your social networks. Any questions or comments, please use the forms below. There are some affiliate links in this article, if you use one I may make a small commission. I love this type of furniture! I have been looking for the right set for our back patio, I just haven’t found it! i love the color of this! It would go perfectly with the palms that we have on our back patio! I will have to look into it! Its also great priced compared to a lot that I have seen! Don’t forget to look into free shipping or a discount for pickup at the store. Getting your outdoor furniture from Walmart has never been easier. This is set is neutral – can match existing outdoor furniture easily – and it is attractive too. Thanks for all the pertinent info, especially about the packaging and assembly. The Cane Bay conversation set can fit into any outdoor decor. It will look best in a beach setting. Better homes and gardens cane bay outdoor patio conversation set sounds like it would be a great fit for a friend of mine. She has a deck that surrounds the swimming pool and I like the color this would bring. You mention it’s a big set and if it were delivered would they also put it together or will that be something additional that needs to be handled in addition? All patio furniture that is delivered to a Walmart store can be assembled at the store level. You will have to check with the local store for charges if applicable. The look of this set would be great around a pool or at the beach. 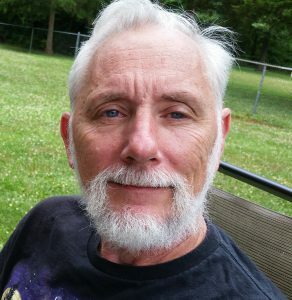 I trying to order a replacement part for one of the chairs. 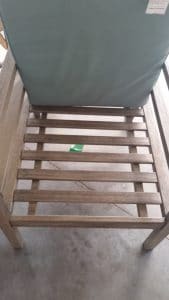 Do you happen to know the manufacturer of this patio set? 1-888-287-4275 9-5 CT or use the E-mail help@crestwoodgc.com. Hope this helps you with your purchase.